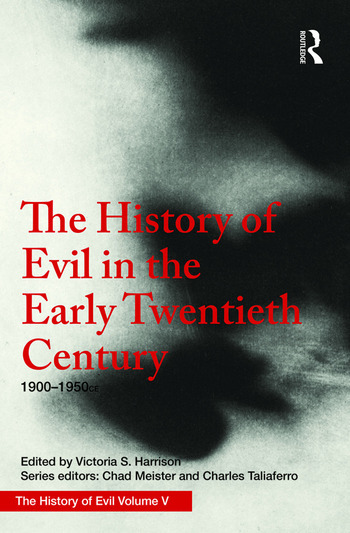 The fifth volume of The History of Evil covers the twentieth century from 1900 through 1950. The period saw the maturation of intellectual movements such as Pragmatism and Phenomenology, and the full emergence of several new academic disciplines; all these provided novel intellectual tools that were used to shed light on a human capacity for evil that was becoming increasingly hard to ignore. An underlying theme of this volume is the effort to reconstruct an understanding of human nature after confidence in its intrinsic goodness and moral character had been shaken by world events. The chapters in this volume cover globally relevant topics such as education, propaganda, power, oppression, and genocide, and include perspectives on evil drawn from across the world. Theological and atheistic responses to evil are also examined in the volume. This outstanding treatment of approaches to evil at a determinative period of modernity will appeal to those with interests in the intellectual history of the era, as well as to those with interests in the political, philosophical and theological movements that matured within it. "Covering a period perhaps more terrible than any other for the amount of evil suffered and perpetrated, this wide-ranging volume offers a variety of perspectives, philosophical, theological, moral and political, for reflecting on the horrors of our all too recent history." John Cottingham, University of Roehampton and University of Reading, UK. A rich, lucid and wide-ranging collection, offering refreshingly new perspectives on evil and suffering in the early 20th century. Anyone interested in gaining insight into the nature of evil, its metaphysical, theological, psychological or political foundations, and the inspiring attempts to defeat it throughout the globe, from East to West, using educational, socio-political, scientific or contemplative means, will find rich food for thought in this superb collection. Nehama Verbin, Tel Aviv University, Israel.